It is great that the County is making good on its post-APAC resolve to enforce the provisions of its ordinances. Kudos to the community activists and recent press that have encouraged them to do so. Planning Dir. Morrison indicated at the Feb. 6, 2019 Planning Commission meeting that review of winery application marketing plans and facilities will be much more closely scrutinized in future to insure compliance with 2010 WDO limitations. While that alone is not enough to curtail the rise of winery restaurants allowed under the code (given the ambiguity of the provisions), it is a welcome commitment. Hear! Hear! Fortunately it sounds like B Cellars will contest the citation, which means that there will be an opportunity to begin defining what is "food service" (allowed) and what is "meal service" (forbidden) under the WDO (see here). At the same time the County needs to vet another provision of the WDO: is the food at an $80, $125 or $185 wine pairing, each of which would be an expensive lunch at most any restaurant, being provided "without charge except to the extent of cost recovery"? What data is required, in a government now obsessed with data-based decisions, to decide if it is? It is an important data number if it shows that boutique wineries are being proposed and built, as I believe, solely because the profit made from wine pairings and events makes up for the more modest profits, or losses, from vanity wine making. Much of the wine industry has become instead an entertainment industry based on a wine-making image, filling up the vineyards with buildings and parking lots and filling up the roads with visitors and employees while claiming to protect agriculture by such urbanization. You know there were some compromises made that probably shouldn’t have been made... It had to do with food services and basically turning these places, some of them, into restaurants. The winery is one of the 33 new wineries (B Cellars is technically an addition to the never-built Miller Winery) so far approved under the 2010 modifications to the Winery Definition Ordinance (WDO). 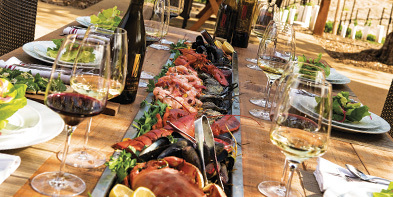 Those modifications allow food to be served as part of winery "tours and tastings" and allow business meetings to be considered as "marketing events". The two modifications, following the 2008 state law allowing wine purchased at the winery to be consumed on site, tipped a profitability point resulting not only in the 33 new winery approvals but in approvals for expansions and use permit modifications to 38 existing wineries. There are currently 24 additional projects in the planning department awaiting approval including the Mountain Peak project next door to me on Soda Canyon Road. A debate is now going on in the county regarding the pace of development brought on by these changes in the WDO and by the county's intent to boost tourism following the 2008 meltdown of the high-end wine industry. The essence of those changes was to allow more food service at wineries, edging ever closer to that so-far taboo entity: the restaurant-winery. The euphemisms abound to create a false distinction: a lunch or dinner is called a "wine pairing"; banquets are referred to as events in the "marketing of wine". There are 3 distinctions that the WDO uses to differentiate a winery from a restaurant: 1. menu options are not allowed. 2. "food service" is allowed while "meal service" is not. 3. food service must be charged at cost. These are meaningless and disingenuous. Meaningless because many restaurants (like Chez Panisse in Berkeley) have one daily fixed menu, and also because "meal" vs "food" is undefined in the WDO providing no enforceable difference. (The Mondavi Winery offers 3- and 4- course "wine pairing dinners" for $150 to $350. B Cellars offers a $125 Chef's Garden Pairing). Disingenuous because a $125 lunch isn't profitable? If the food service were not profitable no changes to the WDO would have been requested in 2010. Why is the food-meal distinction necessary? Under the WDO, wineries are allowed tours, tastings and marketing events with their 'food service' as accessory, incidental and subordinate uses to the winemaking process. In contrast, restaurants are commercial enterprises offering 'meal service' quite able to stand on their own. Food service is important in these applications because it is an effective profit booster. (At Raymond, if only half of their 400 allowed daily visitors went for a $100 wine pairing instead of a $50 tasting that would mean an additional $3.65 million/yr in revenue) With food service the wineries are becoming the subordinate element, the crush pads and caves, as shown in the B Cellars renderings and video as backdrops to the "hospitality experience". The result of allowing these commercial enterprises in the vineyards, nominally forbidden under the county's 45 year old year commitment to protect agricultural lands, is a direct challenge to the Napa General Plan's intent to maintain agriculture as the county's economic engine. The transfer from an agricultural economy to a tourism economy is directly embodied in the restaurant-winery. 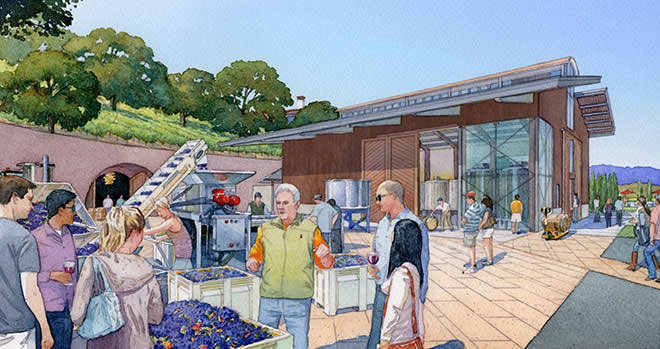 Food service is at the heart of all new use-permit applications, like the high profile Yountville Hill Winery or the remote Woolls Ranch Winery on water-starved Mt Veeder Road, currently making their way through the county meat grinder. Food service is especially important to the tourism experiences in the contentions Raymond Winery application. The new tourist facilities that will be springing up in the next few years present other impacts besides just the vineyard land that they consume. The many well-lit al fresco events lasting until 10pm will eclipse the serenity of dark and quite rural nights, and a late night rush hour of limos will traverse the valley. In-town restaurants may see a drop in their clientele, unless the wineries succeed in attracting the hundreds of thousands of new tourists necessary to fill their tourist slots, in which case residents may look back to the traffic of 2014 as the good old days. In either case in-town restaurants may begin to find their top chefs and experienced staff moving to the vineyards. Also, restaurants and their many patrons may present sanitary waste problems not well suited to rural leach field solutions. And the expanding, labor-intensive tourist industry will need housing, schools, shopping centers and municipal infrastructure for its workforce, an ever consuming municipal and county concern with ever more work for the development industry promoting the tourism wineries. This rant is not specific to B Cellars. Mr. Keys has done a low-key, handsome, and modestly-sized project (comparing it to Yountville Hill and Raymond). His is just an early example of a construction boom that will be played out in the next few years. The 70 or so approved projects now in the construction pipeline will unfortunately be built, and we will bear their impacts. But the many projects in the planning department and the vast number that can be built on the 10 acre+ properties in the county (perhaps on the one next to you) can be stopped with a commitment from residents and the county and anyone else who sees the importance of protecting the agricultural base and the rural character that makes the county special. Sometime in November [now in Mar 2015] the county is convening a community forum to discuss possible changes to the WDO. I would urge everyone concerned about the future of the county to participate.